The Spitfires of 54 Squadron, quickly scrambled from nearby Hornchurch, clash with the Me109s from 1./JG51 over Kent. Below, Me110s from KPRG210 are about to receive unwelcome attention as the rest of the Spitfires hurtle down upon them and in the distance, a group of Hurricanes rip through a dense formation of Do17s from KG76 as they struggle back to France. What clouds there are will be unlikely to give much sanctuary and, for the onlookers on the ground far below, the skies will soon be filled with weaving trails of smoke and debris. For nearly a week the Luftwaffe had thrown everything they had into the attack on southern England in order to annihilate RAF Fighter Command, in preparation for Operation Sealion, the invasion of Britain. And, heavily outnumbered, the young RAF Spitfire and Hurricane pilots of Fighter Command had so far repelled them, at a cost. But on Sunday 18 August 1940, the Germans launched the heaviest formations of aircraft seen in the battle so far. This was to be a grinding day of relentless assaults on the airfields of southern England, the ‘hardest day’ of the Battle of Britain. Robert Taylor has chosen this crucial day to commemorate the 70th Anniversary of the Battle of Britain in his new, much acclaimed, Hardest Days Trilogy. Valiant Response is the third and final edition in the series, continuing the events depicted in the first two releases 'AIR ARMADA' and 'HORNCHURCH SCRAMBLE' and Taylor has skillfully portrayed the scene as the ‘hardest day’ reaches its climax in the late afternoon. Prints of Valiant Response are signed by veterans who bravely flew and fought in those crucial days of the Battle of Britain. As the 70th Anniversary year of one of the most pivotal battles in history, this release presents a fantastic opportunity to acquire one of Robert Taylor’s great aviation masterpieces. 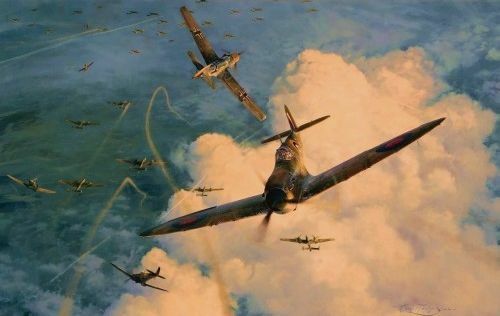 Each print is personally signed by the artist, Robert Taylor, and individually hand-numbered; together with THREE RAF Battle of Britain pilots.